With The City: Los Angeles and Urban Theory at the End of the Twentieth Century, editors Allan J. Scott and Edward W. Soja (who both also contribute chapters to the book) seek “to present an interlocking mosaic of descriptions of different aspects of Los Angeles and … move tentatively toward a new kind of urban analysis.…” (p. viii) They do so by presenting a series of essays in chapter form, contributed primarily by faculty members from the University of California at Los Angeles and the University of Southern California, covering a diverse range of topics from architectural trends and transportation policy to immigration and economic restructuring. Naturally, this approach leads to some overlap and even some contradictions between chapters, a fact which Scott and Soja do acknowledge in their preface. For example, while Scott describes the profound economic effects for L.A. and southern California of cuts in the national defense budgets during the late 1980s and early 1990s (Chap. 9), Soja refers to this same period, in the book’s concluding chapter, as the time which “legitimated the domestic reorganization of the welfare state into the … warfare state.” (p. 456). Despite this fact, The City mostly succeeds in its first stated aim, presenting a detailed and often thought-provoking social, political, economic, cultural, and demographic portrait of Los Angeles at the end of the 20th century. However, the book ultimately fails to achieve a coherent approach toward any new kind of urban analysis, stumbling in the end over misplaced neoliberal rhetoric and the twin semantic and philosophical fallacies of postmodernism and hyperrealism. At other points, the multiple authors raise topics bordering on the irrelevant and insipid (Chap. 3), couch the self-evident in lofty and verbose discourse (Chap. 4), and programmatically recite a curiously paradoxical litany of politically correct socio-urban observations (Chap. 12). Unfortunately, these shortcomings undermine the otherwise important issues covered by many of the chapters. In this review, I will evaluate these failures as the counterpoints which serve to potentially invalidate what could have been an important work. The book has, perhaps, as its two historical poles the Watts riots of 1965 and the more recent period of civil unrest, the greater Los Angeles riots of 1992. Herein, the editors, particularly Soja, most strongly reveal their neoliberal bias. By using the terms rebellion (traditionally defined as “organized resistance to a government”) and insurrection (traditionally defined as “the act or instance of open revolt against civil authority or a constituted government”) to describe these two periods of urban anarchy, they imply an organization and Marxist-style class consciousness among the rioters which simply did not exist. In the book’s closing pages, Soja manages to completely undermine his remaining credibility by openly proclaiming that the 1992 riots were “the largest urban insurrection in U.S. history … being both a consequence and a strategic political expression [my italics] of the postmodern transition.” (p. 459) From a historical perspective, it is very clear that neither of these events were organized uprisings against the government but rather the violent, irrational manifestations of long-standing socio-economic frustration, along with a healthy dose of criminal opportunism. Even Soja must admit to the fact that some of his rebels in 1992 were “yuppies with car phones” (p. 460) who drove into the riot areas to get their share of the loot. Soja’s above-quoted invocation of the concept of the postmodern is not the only such instance in The City, and he is not the only writer to use the term. This fact appears indicative of the authors’ proclivity for contemporary “scholarly” jargon and buzzwords, terms such as postmodern, postindustrial, hyperreality, and the singular, awkward “glocalization” (pp. 442–443)—apparently meaning “local globalization.” Furthermore, these terms often tend to lack real meaning and are sometimes even self-contradictory. Postmodernism is perhaps the most pernicious example of this intellectual doublespeak, a scholarly concept wholly devoid of utility. Permitting myself a … digression, I can briefly put the lie to the theory of postmodernism. If we continue to define modern as “of or relating to recent times or the present,” then we can never enter a postmodern era. Thus the theory of postmodernism is a kind of semantic nonsense, similar and clearly related to other semantically flawed ideas, such as the concept of a “postindustrial” economy. (No one ever discusses “post-agricultural” economics or—though I expect this one to appear at any time now—“post-historical” studies.) To study the postmodern is to study the future, and given the future’s temporal isolation from our observations, its study can only be paradoxical. The concept of the hyperreal, on the other hand, seems to have some utility, at least until it is too closely scrutinized. Here, however, it is actually misused. In an otherwise cogent discussion of hyperreality—the state in which reality and simulation can no longer be distinguished from one another—in southern California (as well as the nation at large), Edward Soja inexplicably writes that one can “taste the food, observe the people, hear the language, and sense the traditions of nearly every nation on earth [sic] without leaving Los Angeles County.” (p. 454) Apparently, in his enthusiasm to prove his point, Soja has paradoxically described the very real recent immigrants (so poignantly described by Paul Ong and Evelyn Blumenberg and by Raymond A. Rocco in chapters 10 and 12, respectively) to the L.A. area as somehow being hyperreal simulacra of themselves! In a chapter-by-chapter analysis of The City, three aforementioned weak points reveal themselves. In Chapter 3, Charles Jencks attempts rather inconclusively to define an “L.A. School” of architecture. The best he can achieve, however, is the description of a “school” defined only by its lack of cohesion and commonality, one which immediately disintegrates the moment its “students” attempt to formulate its precepts. The relevance of this topic to the larger framework of both L.A.’s built and socio-cultural environments seems largely lost in the vapid discussion of “hetero-architecture” (pp. 72–73) and postmodern architectural philosophy, where a building may be constructed, as was one structure in the Chiat “office-village,” in the shape of a pair of binoculars (pp. 69–71). 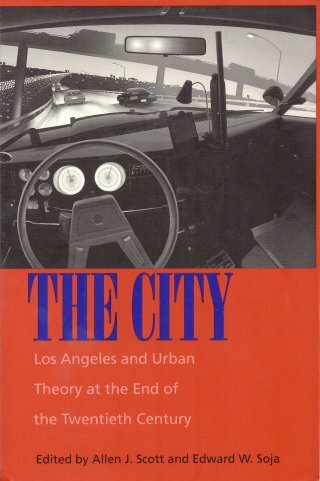 In Chapter 4, Michael Dear describes Los Angeles as a postmodern metropolis “in which past traditions and intentionalities have collapsed and previous verities have been suspended.” (p. 77) While this chapter is an otherwise interesting historical analysis of L.A.’s development into a polycentric suburban sprawl, Dear, too, trips over the semantic stumbling block of postmodernism. Attempting to describe the city’s transition into postmodernity, he defines modernity as “the experience of contemporary life that has been fed by numerous movements including science, industrialization, demographic change, urban growth, mass communication, nation-states, social movements, and the rise of worldwide capitalism.” (p. 81) In other words, we are where we are today as a result of all the various forces which have acted upon us in the past. (Other scholars have created a name for this particular phenomenon: history.) In addition to stating the obvious, this definition by reference to “the experience of contemporary [my italics] life” again precludes the existence of a postmodernity. Dear also describes Los Angeles as “a fragmented mosaic of polarized neighborhoods segregated by race, ethnicity, gender [my italics], and class.” (p. 97) This paradoxical statement coincides with a similar one made by Raymond Rocco in Chapter 12. Within an otherwise compelling discussion of the so-called “Latinization” of L.A., Rocco makes reference to “a reconfiguration of the structure of social location (racial, ethnic, class, gender [my italics]).…” (p. 365) And while Rocco’s precise meaning is somewhat unclear, he is only a comma away from describing, as Dear very clearly has, some sort of gender-oriented ghettos or barrios, where women are segregated from the rest of society. I can only assume that these references are involuntary and inadvertent, a politically correct reflex response, almost certainly conditioned by the common liberal classification of women as a “minority” group (even though they constitute over 50 percent of the general population). In conclusion, The City, while successfully painting a diverse portrait of modern Los Angeles, is a book that fails to live up to its full potential. The powerful and important issues which many of its chapters discuss are undermined by the flawed dialectic of several of the books authors and particularly its editors. Clouded in many places by modern intellectual doublespeak and sociological concepts of dubious utility, The City will irritate those readers who are not easily impressed by sophisticated-sounding jargon and confuse those who are, leaving both classes of reader to potentially overlook the book’s otherwise timely observations regarding the social, economic, and cultural forces now confronting both Los Angeles and the nation at large.